How many people have still got theirs from new? Re: How many people have still got theirs from new? What are you moving into? Like me, I never thought I'd see you getting rid of the Convertible. Keep in touch, and post pics when you get the new ride. Later. '12 FLHXSE but technically it was used when I bought it. It had 5k a guy bought it and drove it for 5 months then traded it in. He had a factory matched tour pak installed so I snatched it up. I have done so many mods and put on so many miles that I am too upside down (getting worse every weekend) to be able to sell it so thankfully I love it and I have it just about perfect for me! SDCVO, this is me as well. Besides with the seat height moving upwards my feet get farther away from the ground and I ain't wearing Gene Simmons boots to get there. I spent countless money and time to get mine to fit me. Bars, seat mods, pegs, all the comfort things. I stopped into Dubuque Harley to pick through the clearance rack and a young salesman was all over me. "Nice CVO, come take a look at this CVO RG" Me, I'm a street glide kind of guy. "Just come check it out can't hurt" Fine. I go he has me sit on it couldn't even touch the ground with more that my tiptoes. 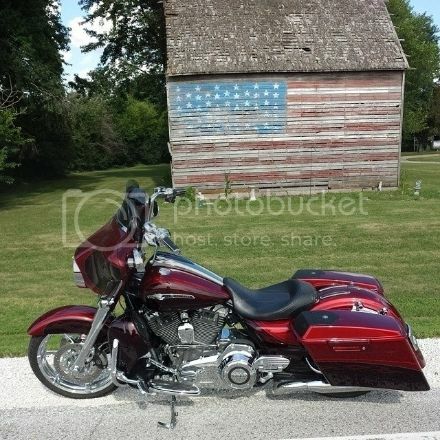 He actually HURT his chances of selling me a bike by showing my this new one lol. You and I must be about the same height. Me 5'6"
Still got mine 6 yrs on now and still loving it. CVO1: 2012 CVO Convertible aka “Rose”...my one and only. I haven't been here for a couple years. I still have my 2012 and really enjoy it. It is a very easy bike to handle. However, it's my first Harley and I think I read on this site somewhere that you should never sell your first Harley. Although, I have acquired a new girlfriend since I've last posted and she is not overly impressed with the ride on longer trips. So my intent is to purchase a new CVO Road Glide if/when they come out with one...preferably an Ultra with all the bells and whistles. But I will never sell Rose. It's not the destination, "IT'S THE RIDE"
CVO2: 1983 Shovelhead "Ole Black Betty"
Has 47k miles on it and still running strong. With old age has come the wisdom to embrace my immaturity. model 2012, still have mine, 65000 km on it, not interested to sell it. How do you clear your mind between meetings: wind in my face at 60mph and a rumble between my legs.